A series of books and short stories for middle grade readers and some adults. Lord Murray Eames Bingle was a famous gentleman (some would say dilettante) detective of the 20s and 30s. 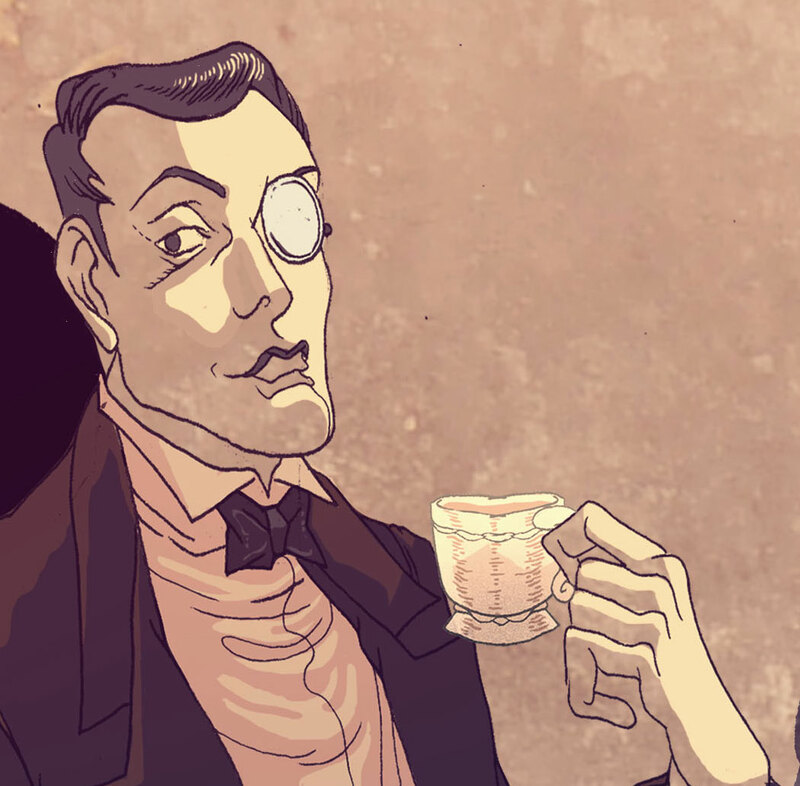 His many adventures have been chronicled in a series of novels (such as The Case of the Floating Currency or An Ear for Murder) and short stories. The seventh in the line of noblemen bearing the title Lord Bingle, Murray Eames was commonly believed to be a loafer and bon vivant by his contemporaries and especially his Great Aunt Ingrid. The Dowager Duchess seldom wasted an opportunity to express her displeasure with a perceived lack of ambition in the young aristocrat. Still, Bingle's tendency to consort with society's more suspect members like musicians, actors, police and criminals, marked him as a bit risque in more polite society. And the Gentleman Detective, as newspapers of the time called him, distinguished himself even more by being accompanied on many cases by a waterfowl he called "Muddles, my butler duck." 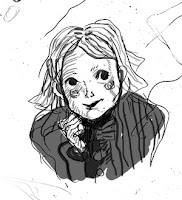 Marcella Higgins is the daughter of Ward and Violet Higgins and lives with her parents in a suburb of the city in the same house where her father grew up. Her uncle Morris is a detective in the city's police force. Morris, who Marcella has nicknamed Uncle Detective, has given Marcella a set of notebooks and encouraged her to keep a written diary. Although initially skeptical of the need to record the events in her life, Marcella has recently become convinced of the necessity of using her personal journal to detail the strange events happening around the city to her and her friends. Events that adults cannot seem to notice. Marcella collects books in the Magnolia Berwyn, Girl Detective series. She recently found a copy of Magnolia Berwyn and the Poisoner's Apprentice at a church sale and found the guide to poisonous plants inside the book to be most useful in a visit to the City Conservatory. Marcella's favorite band is Dumbcane and she is hoping that her parents will let her see them play when they come to town. Her favorite drink is Ginger Cream Ale, which can only be found at Lucky's Diner in the city. The publishing process is in its final stages as The Continuing Case of Manny Tippitoes gets converted to the formatting for Kindle. I know from my experience at independent record labels that this "going to market" time (to use corporatespeak) can be uniquely frustrating. You know that you have a good product and you want to tell people about it, but the product is not available for them to buy. Sometime in mid-to-late October there will be a book available on Amazon.com, the e-book will be available via the Kindle and there might even be versions ready on the Nook and Apple formats. Until that happy day arrives, I'm going to post some brief profiles of the major (and minor) characters in the first book of the Manny Tippitoes trilogy. When available, I'll use some of Anna Wieszczyk's artwork in the book. You can buy a book from my Createspace Store page here. Use the discount code 5ZLTLVRC and get a $5 off. The paperback is also available on Amazon.com and the ebook is available for the Kindle. The Nook version is available now at Barnes & Noble. iPhone and iPad versions are now available at the Apple Store. 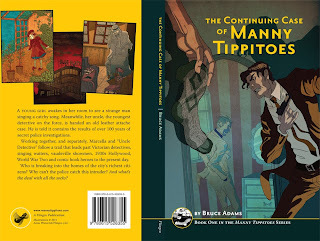 I just self-published a middle grade children's book entitled "The Continuing Case of Manny Tippitoes". 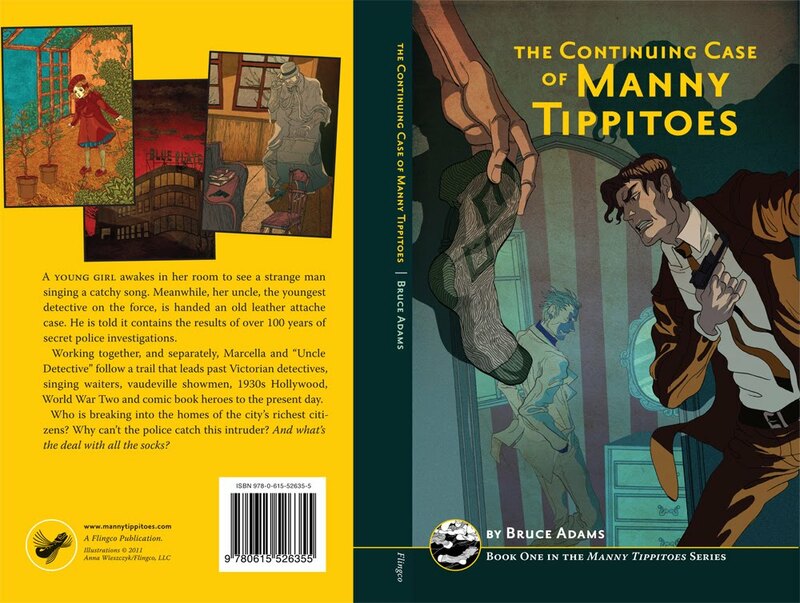 This blog is a record of my inspirations, impressions and raw material as I continue work on promoting the book and writing more about Manny Tippitoes and his adventures. Copyright 2010 by the author. All rights reserved. Simple theme. Theme images by Nic_Taylor. Powered by Blogger.